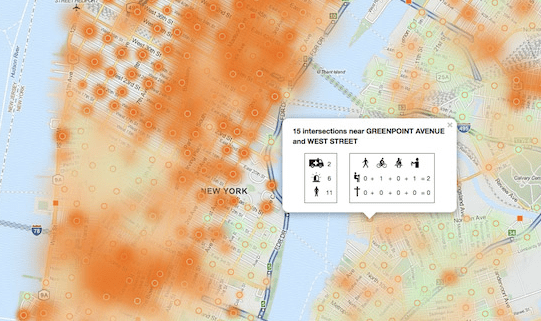 The city went live with a major upgrade to NYPD’s crash data today. Information about traffic crashes was previously released via difficult-to-use monthly updates posted on the police department’s website. Now it’s available through a standardized feed updated daily on the city’s open data portal, allowing the public to sort crashes by time of day, street, zip code, and borough, as well as by the number of injuries and fatalities. Later today EDC will be launching the BigApps competition, and Mayor de Blasio has asked NYC’s tech community to take on the issue of street safety. With this NYPD data upgrade, developers will have more flexibility to build useful tools for the public. A community board, for example, could receive an alert within 24 hours whenever there is a traffic injury or fatality within its borders. Many in the civic tech community are also hoping for more than just improved crash data. While NYPD already reports how many tickets it issues for moving violations, there are significant limitations to that information. Precincts often cite this type of geographically detailed information on moving violations to report their enforcement efforts at public meetings. Today’s announcement didn’t include any news about opening up this data to the public. The People of New York City. Geocoded data is great for many purposes, but zones are helpful for tracking trends over time (e.g. http://makequeenssafer.org/home/2014/05/vz-2014-03/). It also helps with analysis when GIS isn’t available. It would be great if NYPD could tag its new data feed by precinct. The old data, which is still available had precinct data in it. the city has a shape file of all the precincts on nyc open data that could be used to assign each collision to a precinct. There’s a problem with that, though: Let’s say a crash occurs on a street that forms the border between two precincts. Which precinct is it assigned to? The shapefiles likely won’t help there. NYPD knows which precinct has jurisdiction, but it’s not obvious to the public. Indeed. 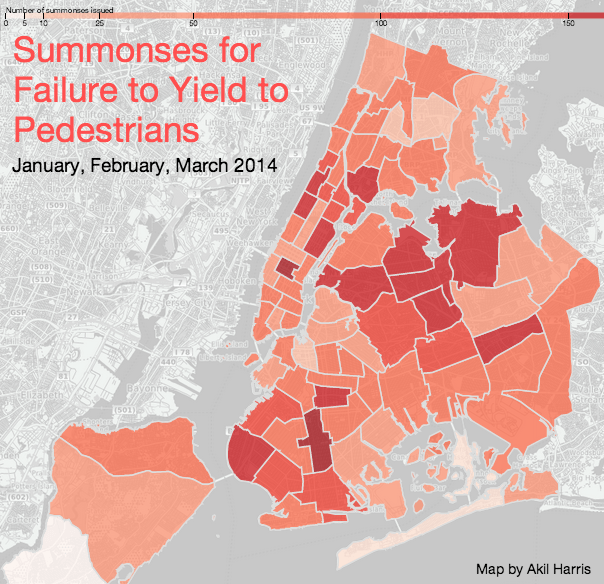 A precinct can increase the # of speeding tickets it issues fivefold, but if all those tickets are given out on limited-access highways, there will be zero improvement to pedestrian safety. Yes, exactly. What you said really makes the case for increasing the NYC speed limit on limited access highways to the 95th percentile. That will in effect severely limit the number of tickets police can give on highways, forcing them to concentrate instead on local streets in order to meet their (supposedly nonexistent) ticket quota. Giving speeding tickets on highways with artificially low legislated speed limits does nothing for safety, even for motorist safety. The local streets are where the bulk of speed enforcement, indeed traffic enforcement in general, needs to be. One problem with the new NYPD daily crash data format is that vehicle type has been removed from the csv file. by comparison to Portland Police data. A shame, as real-time or at least standardized update periods would increase the value of this data set immeasurably from the point of view of citizens. to this NYPD data? It’s nearly useful. The city will make "TrafficStat," NYPD's tool for mapping and analyzing traffic collision data, available online to the public. It's an improvement but lacks one very important type of information -- data about where police are enforcing traffic laws. To reduce collisions involving city fleet vehicles, the Department of Citywide Administrative Services began collecting and sharing data on such crashes in 2014. NYPD was the only agency not to comply, but in response to a FOIL request from Streetsblog, the department recently shared basic numbers on crashes involving department personnel.